Tree Lobsters! : Free 2010 Desk Calendar! 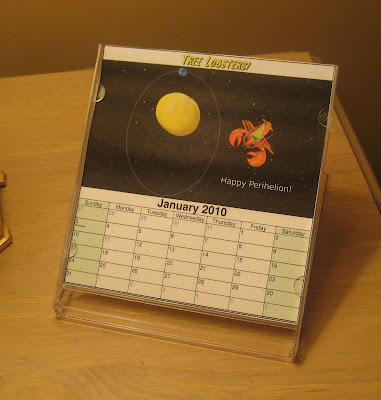 The 2010 Tree Lobsters desk calendar is available for download. Now your desk can have the same cheesy graphics and pointless humor you've come to expect from the Tree Lobsters webcomic. Twelve full months absolutely free! And it's guaranteed not to bring about the end of the world, unlike those other calendars. To get your free 2010 Tree Lobsters desk calendar, download the PDF, print and cut out. Instructions on how to make the stand from a DVD jewelcase can be found on Big Huge Labs. Tip: A thin layer of glue stick across the top of each page will let you stack them together (a la PostIts).